Colonial Cabinet members perform at the 25th annual Colonial Inauguration for students and parents. 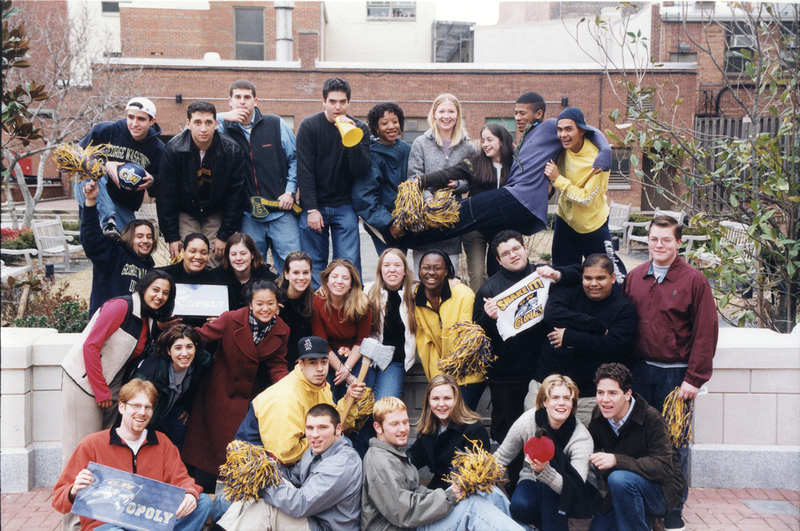 Each year, the George Washington University produces a diverse class of graduates, many of whom go on to become senators, actresses, top athletes and leaders in a range of industries. Though every student pursues a different path after walking across the stage at Commencement, each student starts his or her journey at the same place— Colonial Inauguration. 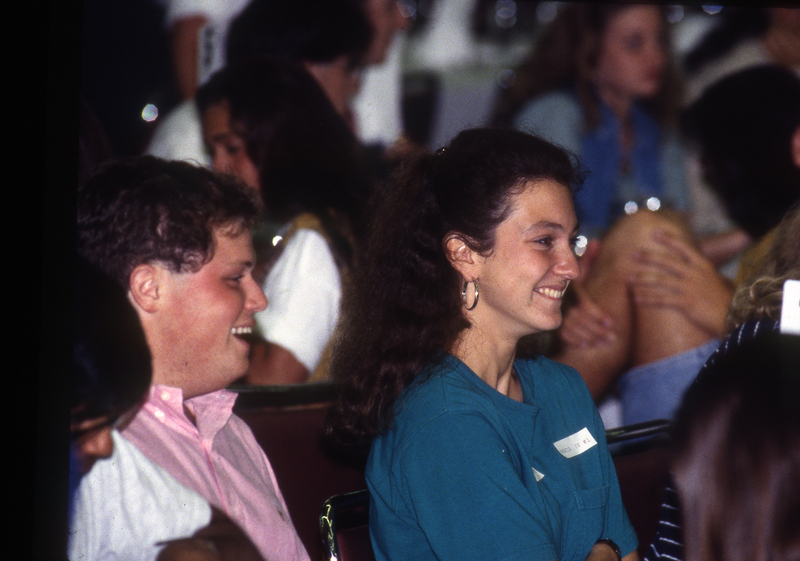 The first session of CI was held during the summer of 1990 and over its 25-year history, the summer orientation program has become a much-loved tradition that welcomes students and their families to the GW community. 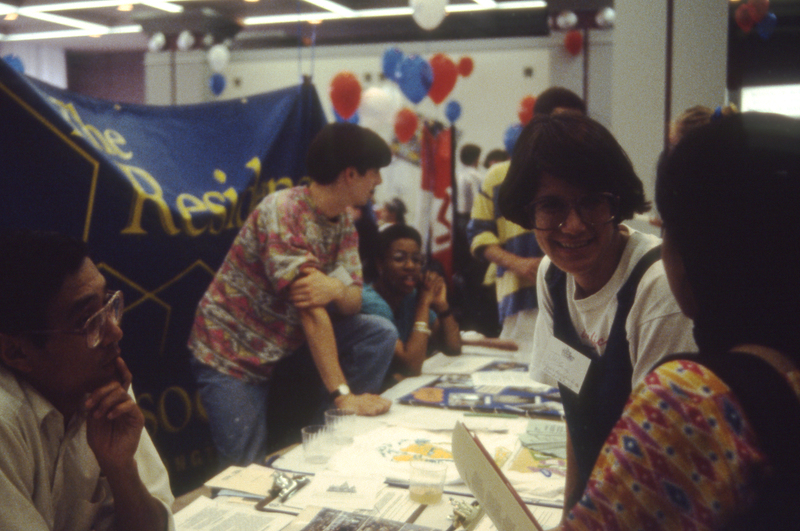 Planning for CI was launched in 1989 by then-President Stephen Joel Trachtenberg to strengthen the campus identity. Then-Vice President Robert A. Chernak, Ed.D. ’97 and Helen Cannaday Saulny, who acted as a special assistant to Dr. Chernak, played a pivotal role in the development of the program. Nearly 1,100 incoming undergraduate students and their families participated in the first CI, a small number compared with the more than 5,000 students and family members who will attend the two and a half day program over the course of five sessions during summer 2014. 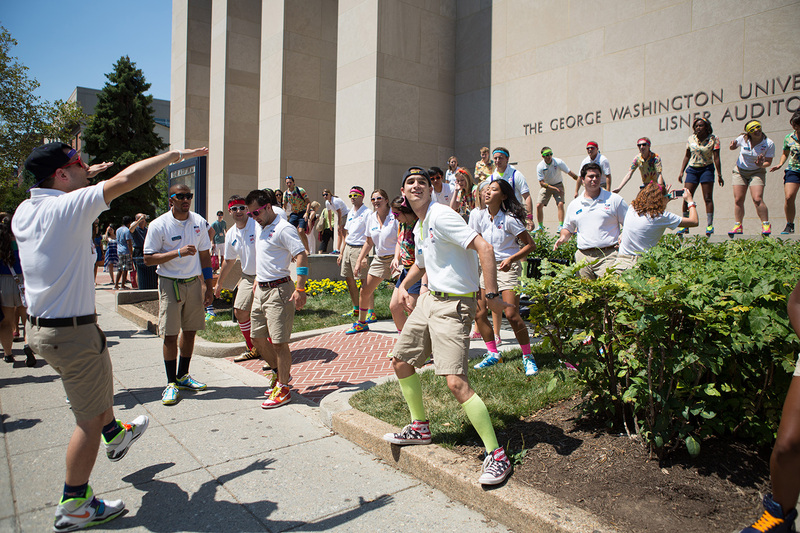 A group of nearly 50 student staffers, including 33 Colonial Cabinet members representing three countries and 21 states, will guide incoming students and parents through a high-energy schedule of activities that provide insight into academics, student engagement, campus resources and alumni connections. Dr. Konwerski fondly remembers an enthusiastic staff and cherry pie giveaways during the first CI, held when he was a rising senior. The following semester he joined the Colonial Cabinet selection team as a student intern in Student and Academic Support Services which later became the Division of Student Affairs. By 1992, Dr. Konwerski had transitioned from a graduate assistant role to the program coordinator for campus activities. His duties included contributing to the planning of CI and supporting the Colonial Cabinet. Executive Director of Planning and Outreach Robert Snyder, B.B.A. 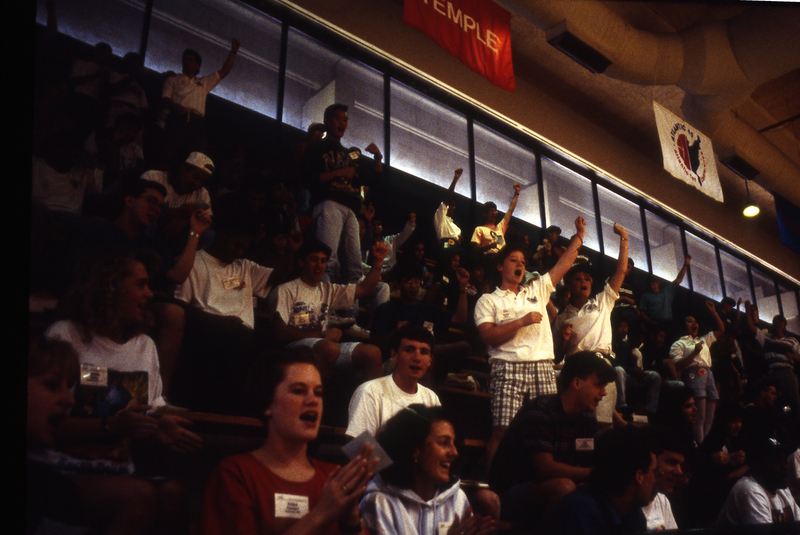 ’95, was an incoming freshman in 1991, the second year of the program. Ms. Moore said that programming for students is enhanced based on emerging trends in the student body. Ever evolving, CI now includes a fall and spring session for transfer students and special workshops that address the specific needs of international students. CI has also always been geared toward welcoming parents and families to GW. That tradition lives on through the CI Siblings program and the work of the Office of Parent Services and GW Parents’ Association. Executive Director of Parent Services Rodney Johnson, who has worked with the program for 24 years, offers two workshops, “GW 101” and “Parents Are a Priority,” to guide parents through the process of sending their children to GW guide parents through the process of sending their children to GWand offer suggestions for engaging in the university community. He also started a tradition of sitting down with parents for informal conversation over dinner at Aroma Indian Restaurant before strolling to the White House—an experience that highlights GW’s prime location in the heart of D.C., he said. Though many things about CI have changed, many traditions have remained the same—from enjoying the Buff and Blue BBQ and meeting student leaders and faculty, to learning the fight song, getting to know academic advisors and administrators and touring the monuments at midnight. The high-intensity introduction can be a lot for incoming students to absorb, but at its core CI is an opportunity for students to get to know their home for the next four years, Ms. Moore said. Speaking from experience as an alumnus and staff member, Mr. Snyder agreed. The first Colonial Cabinet poses for a group photo in 1990. Students form a conga line at the first Colonial Inauguration held in the summer of 1990. 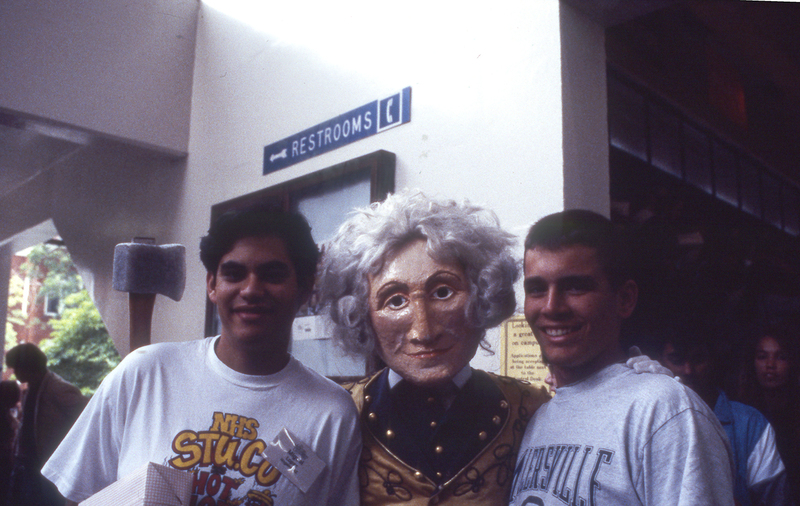 Students pose with George, the mascot representing university namesake George Washington, at CI in 1992. 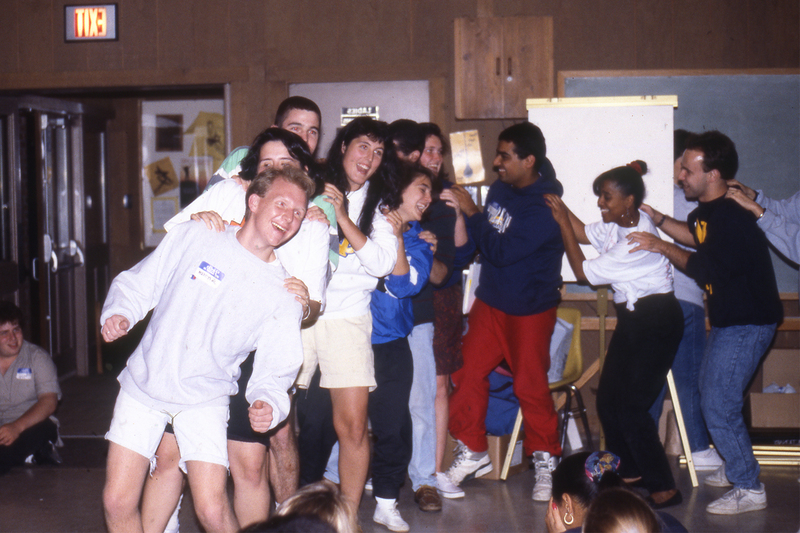 Students get to know one another at CI dinner in 1993. 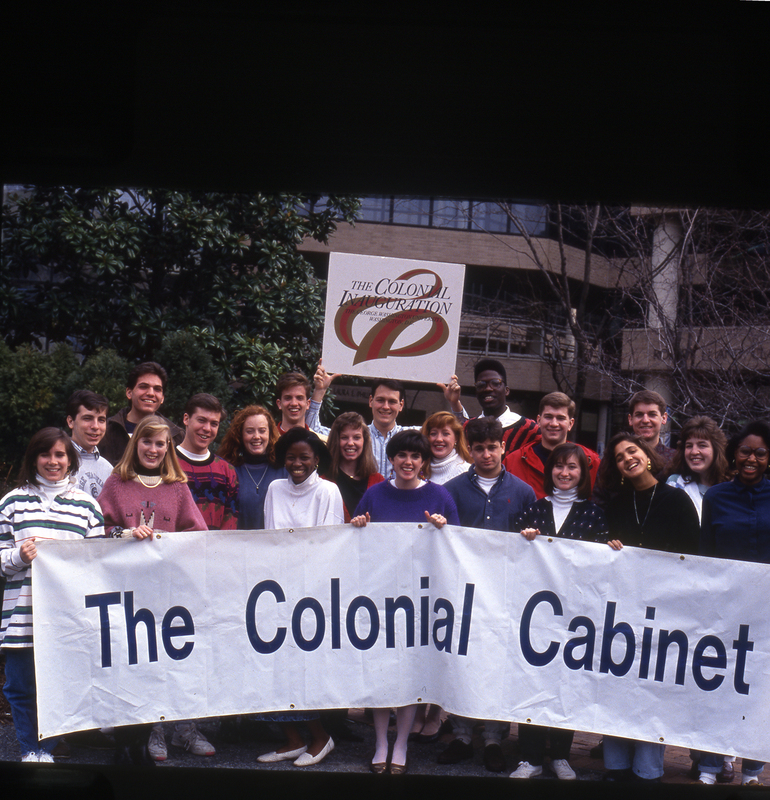 The 1999 Colonial Cabinet poses for a group photo. Colonial Cabinet members entertain at the close of CI during the summer of 2012. Colonial Cabinet members coordinate their outfits with colorful sneakers in 2012. 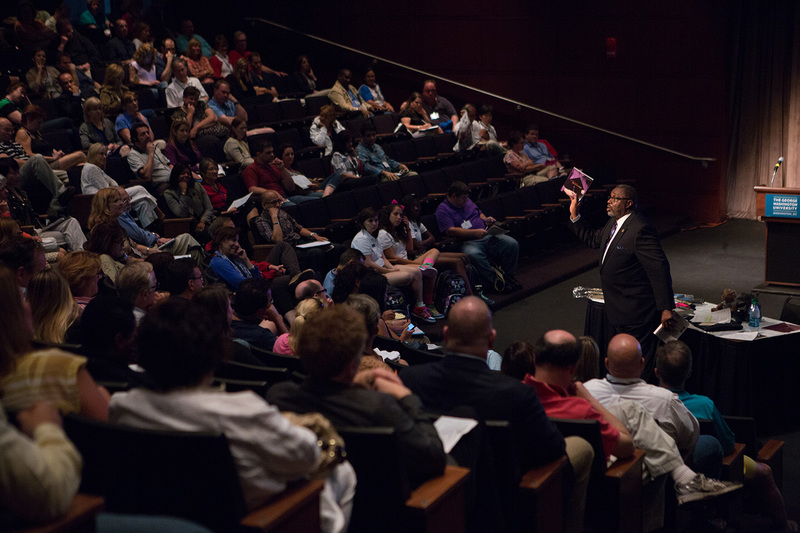 Executive Director of Parent Services Rodney Johnson prepares parents for the GW experience during GW 101 at CI in 2013. 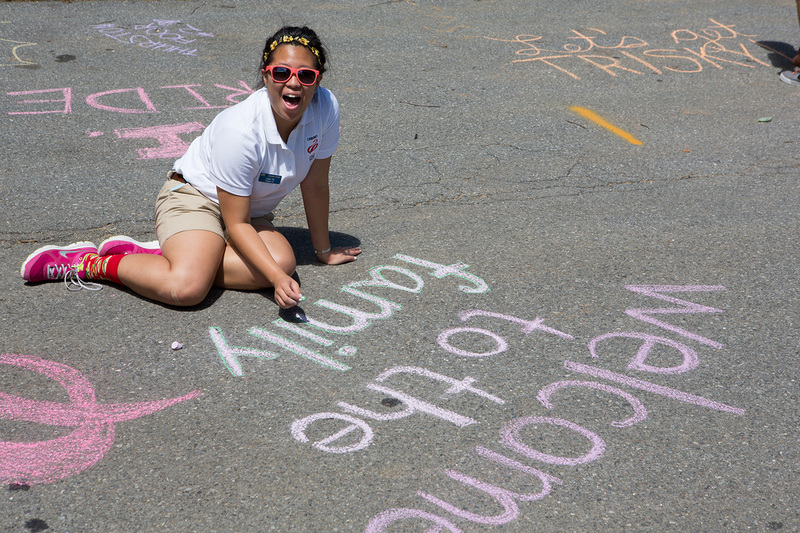 A Colonial Cabinet member sums up the spirit of CI in four words, "welcome to the family."